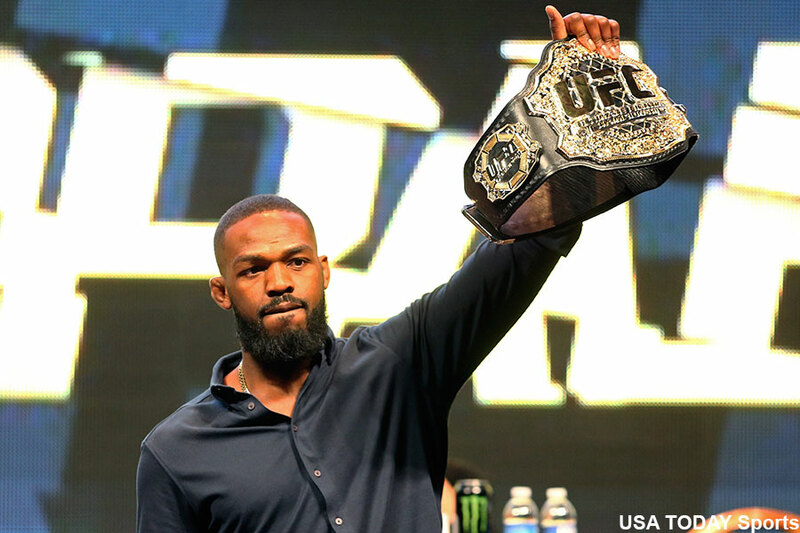 UFC interim light heavyweight champion Jon Jones (pictured) did something no fighter has ever done just 13 hours after flunking a anti-doping drug test – he held a press conference to try and win some votes in the court of public opinion. As we all know full well, that’s an impossible task because professional athletes are perceived as guilty until proven innocent when it comes to performance-enhancing drug use. But Jones tried his best (I think), and failed miserably (I know). Jones was emotional and teary-eyed as he sat at the podium with his manager, Malki Kawa, to his left and publicist, Denise White, to his right (we’ll get to the two of them later). Jones made a brief apology to fans, UFC owners, staff and even Daniel Cormier, who will now miss out on the biggest payday of his career because of Jones’ latest blunder, to kick things off. After his generic apology, Jones opened up the floor for questions. “Jon, can you give us any details about the test, what was it for?” a reporter asked. Jones quickly passed the microphone to Kawa. Second question: Jones deferred to Kawa. Third question: Kawa was again rocking the mic as Jones sat in silence. Fourth question: Jones bounced from his own presser to “get his emotions together,” according to White. When Jones returned, he had trouble putting sentences together – either because he didn’t know what to say or had trouble holding back tears. If Jones thought that pouring on the waterworks was the best way to gain public support, he was dead wrong. The only cards Jones had to play were the sincerity and honesty cards, but he opted to fold his hand instead. Jones and Kawa refused to disclose the substance(s) that were discovered in Jones’ system. Kawa said that a supplement “could have” caused his client to get flagged on the June 16 test conducted by the USADA, but wouldn’t confirm it. Jones essentially fingered supplements on at least three separate occasions, though. Kawa stated that Jones’ B sample is currently being screened in Utah and they are hoping to have the results back tonight. They are fully intending on filing an appeal, regardless. With Jones facing a two-year suspension during his prime fighting years, what other choice do they have? Huh? So which one is it? The exact same supplements your entire illustrious career, or some new ones for this training camp? By the way, Jones used to be sponsored by Six Star Nutrition. He is now sponsored by GAT, so he hasn’t been taking the exact same supplements. It’s possible that Jones could somewhat clear his name like fellow UFC fighters Tim Means and Yoel Romero did after they violated the anti-doping policy. The pair proved that their supplements were contaminated and had their suspensions reduced to just six months. From the public’s perspective, however, the primary difference is that Jones is held to a much higher standard of accountability given his salary and stature in the sport. To plead ignorance was the wrong play because Jones has all the means in the world to ensure this never happened. Jones said that he didn’t even know how to pronounce the substance that he tested positive for. Although claiming he was most upset that he would now be labeled a cheater, Jones would not throw the supplement maker under the bus. “Let’s figure this out before passing judgment,” Jones said. The problem with that is, if a truly innocent athlete is being accused of cheating, most would think they would scream to the high heavens to profess their righteousness. Why not bring every single supplement container that he consumed during his UFC 200 training camp to the press conference for the world to see. He could then say something along the lines of – These are the only products that I have taken and nothing on the labeling is banned. And because I am a multimillionaire, I also had all of these screened by a credible third-party agency to ensure their purity before I ingested them on a daily basis. Instead, Jones didn’t want to disclose the illegal substance that got him pulled from UFC 200 as if he’s going to try and clear his name via loophole. It’s going to come out eventually, so why not be forthright? That would at least show that there’s nothing to hide. Furthermore, when asked what vetting process Jones enforces when supplements are incorporated into his regimen, Jones decided to play the I-didn’t-know-so-don’t-blame-me card. Jones is essentially saying someone came up to him and said, “Hey, Jon, take this. It’s fabulous!” And Jones, the most decorated light heavyweight champion in UFC history, repeatedly pumped it into his body without a second though. That wasn’t even the funniest part about today’s press conference. No, I’m not even talking about when Chael Sonnen, arguably the biggest cheater in the history of cheating, asked Jones a question about his failed PED test. The most comical part took place after Jones left the stage (for the second time) and White stood at the podium with her PR cap firmly affixed and pleaded with the media to emphasize in our articles that Jones has been nothing but an “exemplary client” during their past 12 months together. Oh, and don’t forget to add that Jones has worked extremely hard. Sure, Denise. Is there anything else you’d like to spoon feed us in our pieces? Perhaps you should worry about how you’re going to spin your client’s latest setback, and more importantly, conquer the daunting task of getting the public to believe anything Jones ever says again.